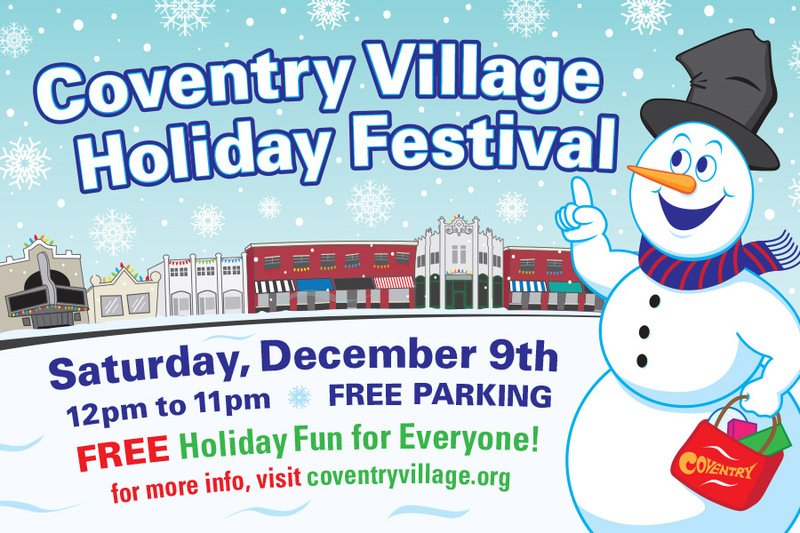 The 5th Annual Coventry Village Holiday Festival is Saturday, December 9, 2017 from Noon to 11 pm. FREE and open to the public + FREE PARKING ALL DAY! ✮ 12:00 PM – 6:00 PM Holiday Shopping Helpers (Coventry Main Parking Garage) Need holiday gift ideas? Our Coventry Village Holiday Ambassadors are happy to help with gift suggestions for the hard to shop for loved ones on your holiday list. ✮ 12:00 PM - 9:00 PM Vote for Your Favorite Coventry Merchant Holiday Window (pick up the official ballot outside the parking garage) Cast your vote and help us determine which Coventry Village spot will win these year's holiday window decorating contest. ✮ 1:00 PM – 2:00 PM Meet the Authors & Book Signings (Mac's Backs-Books on Coventry) Keith Allen, author, designer, illustrator and paper engineer of 'What a Mess! A Pop-Up Misadventure' Pop-Up Book -AND- Thrity Umrigar, author of the kid's book 'When I Carried You in My Belly will meet with fans and sign books from 1 PM - 2 PM. ✮ 1:00 PM – 6:00 PM Photos with the Grinch, Rudolph, and Frosty (Coventry Road) The Grinch, Frosty, and Rudolph will be roaming the neighborhood, spreading holiday cheer and taking photos with fans. ✮ 2:30 PM –5:00 PM Ice Carving Demonstrations (Coventry Road) Watch as professional ice sculptures transform ordinary blocks of ice into beautiful holiday art displays. ✮ 3:30 PM – 5:30 PM Kiddie Karaoke + Kids Crafts (Grog Shop) Fa-La-La-La-FUN! Free karaoke for kids on the Grog Shop stage + kids can make a winter craft with Artful Cleveland. ✮ 5:00 PM – 9:00 PM Lolly the Trolley Holiday Light Tours (Tickets: Kids 12 and under: $1 / Adults: $3) 100% of ticket sales to benefit Heights Emergency Food Center --- Enjoy a holiday lights tour on the iconic Lolly the Trolley. Tickets can be purchased on Saturday, December 9th (starting at 12pm) at the Coventry neighborhood ambassador station, located outside the main parking garage. Seating is limited, early ticket purchase recommended. Each tour is approx 20 minutes. Last tour @ 8:30 PM. All children must be accompanied by an adult. 100% of tickets sales to benefit the Heights Emergency Food Center. ✮ 8:00 PM – 10:00 PM Live Music: Shawn & Shelby (La Cave du Vin) Live music from Cleveland-based duo, Shawn Brewster (acoustic guitar /vocals) and Shelby Sangdahl (cello). No Cover. Take a FREE ride on the BlueLink Shuttle (Picks up every 30 minutes outside the Coventry Road parking garage from 12 PM - 6 PM) and enjoy these festive happenings in University Circle.